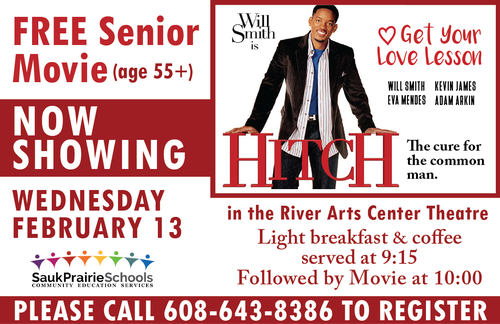 Join us for the FREE Senior Morning Movie at the River Arts Center and bring a friend! In February we are showing Hitch with Will Smith. Light breakfast treats are served prior to the movie. Please enter through the Gallery entrance to the right of the River Arts Center. The Movie starts at 9:30am. Please call the Community Center to RSVP at 643-8386.